Knock over zombie-pins without knocking down the king-pin. 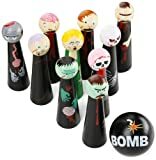 A zombie themed table top bowling game. This is fun indoor activity and easy to play. Features 2 miniature bowling balls and 10 handcrafted wooden miniature bowling pins. A fun game for 2 players. Warning Choking Hazard. Contains small parts, not for children under 3. It was the search for some "human time" with friends and family - time away from televisions, computers, cell phones and pagers - that inspired Front Porch Classics to bring people together through game play. A few dads from Seattle got together on a common mission to create unplugged family entertainment to design games that would engage friends and the whole family (yes, multiple generations) around the coffee table in laughter, sharing, and building memories. In a few short years, Front Porch Classics has established a national reputation for creating beautiful games designed to live in your home or office, on a favorite coffee table, bookshelf or desk. Their award-winning products have become top sellers in specialty stores everywhere. How do they do it? The formula is simple. Every Front Porch Classics game combines four essential elements: Rich Story Telling, Elegant Design, Ageless Appeal and Limitless Play. All Front Porch Classics products feature wood, leather, metal or other high quality, durable materials. The games are built to last a lifetime. Drop in for a minute and you'll see why Front Porch Classics games are achieving legendary status. Here's a worthy destination for game night fiends, or family and friends seeking to reconnect through play. DVG: Rise of the Zombies!